ARTEH® - Hotels and Resorts has the pleasure to announce that Douro Palace Hotel Resort & SPA was awarded the Unique Resort & Spa of the Year by the Travel & Hospitality Awards. At the annual celebration, the Travel and Hospitality Awards panel distinguished the Douro Palace for the excellence of the service and the experiences it provides to each guest. These prizes are awarded by the entity itself, which, together with travel jury members around the world, prize the best hotels, spas, restaurants and tour operators. 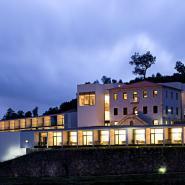 Discover the Douro Palace Hotel Resort & SPA with ARTEH®.